In a city as opulent-- and geared toward tourists-- as Paris, it can sometimes be difficult to find an affordable café or brasserie when you're on a tight student budget. Classic cafes like Le Select, Cafe de Flore and Les Deux Magots were historic haunts for cash-strapped artists and writers, but now demand a small fortune for an espresso or bite. For student travelers looking for a good place to refuel with coffee and food, work and study in peace without being pushed out the door, or enjoy free wi-fi, this list offers a few, cheaper alternatives for your wallet without sacrificing any of Paris' trademark charm. Post-dusk, some of these are also great nightlife spots. Once you've scanned this list, make sure to check out our rundown of the best Parisian bars geared to students. 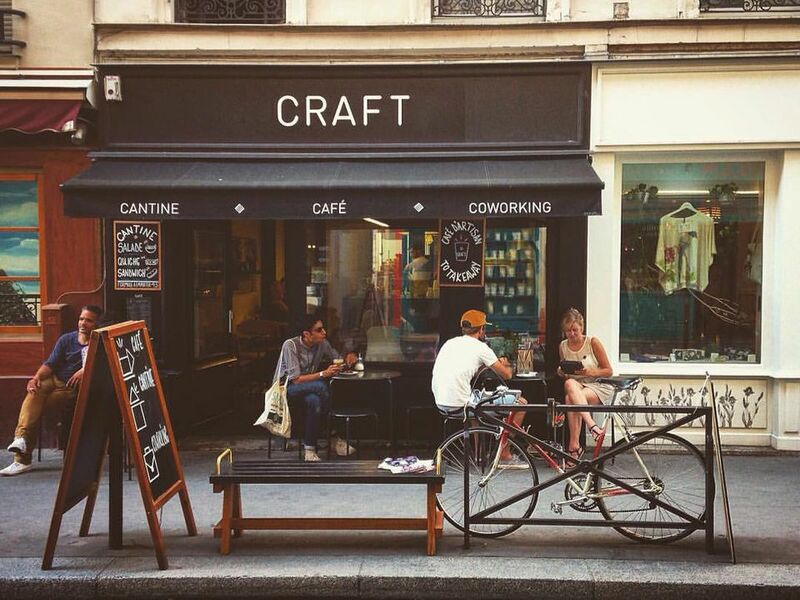 A modern, trendy café close to the Jacques-Bonsergent metro stop and near the student-packed Canal St Martin district, Craft provides a welcoming environment for young professionals and students at affordable prices. The espresso will run you only a couple of Euros, while free WiFi and a relaxing, acoustic-heavy playlist provide the ease and comfort necessary to keep you here for hours on end. Craft's atmosphere is much owed to the venue's minimal set-up, delicious pastries, and the vibrant energy of its customers. A popular spot for locals looking to enjoy some terrace seating in the lively and gritty Belleville district, Café Cheri(e) boasts a diverse line-up of Parisian DJs on weekends, and a low-key, daytime environment for anyone hoping to get some work done before the party starts. Occasional art exhibitions add some extra flavor to the already colorful interior-- all cherry red-- as well. Free wi-fi is available. Just adjacent to the popular Parisian concept shop Merci, Café Cinema Merci offers an upscale, vintage vibe with its old Hollywood-themed café/restaurant space. Classic, black-and-white films are casually projected onto the wall, inviting you to enjoy a scene or two while you eat--or the entire thing! Merci's elaborate ambiance takes its cues from the era that every romantic comes to Paris in search of. No Wifi is a drawback for those trying to get some work done, but come equipped with a pen and a Moleskine, and it won't be long before you feel like a regular Hemingway. This bustling, New York-style brasserie specializes in Italo-American cuisine, and comprises three spacious seating areas to give customers some breathing room. Set near the northward Bassin de la Villette (feeding into the Seine) with outdoor seating and WiFi, Dock's is an ideal setting for any warm summer day in the city. On Fridays, take a nighttime stroll along the river, and then head over for their karaoke night! Also in Montmartre and located on the corner of Caulaincourt & Rue Francoeur, Francis Labutte is a lively cafe/bar open nearly all hours of the day for its young, on-the-go clientele. The food is good, but the prices are even better, with items like espresso at around €2 and a 50cl Grolsch beer at just over €5--certainly beating anything you'll find in the more central parts of the city. Terrace seating is available for a warm day, and inside, the space's off-the-wall decor will provide an exotic backdrop to your morning, afternoon or evening, without feeling too kitschy. The 18th is an up-and-coming area for young adults in Paris, and places like Francis Labutte show you exactly why. A popular daytime bar and restaurant situated between Bastille and Voltaire in the teeming 11th arrondissement, La Fée Verte offers WiFi for the casually corporate as well as an appetizing lunch and dinner menu. An elegantly styled interior tops it all off, sporting a look that blends the classic, Parisian Art-Deco with a few contemporary touches. And here's a bonus: when nightfall comes along, the more adventurous should be sure to stick around and meet La Fée Verte herself, their specialty absinthe. Café Charbon has long been a leader on the famous Oberkampf nightlife scene, with its founding dating back to the Second Empire of Napoleon III. Open from 9am until 2am--and even 4am on Friday and Saturday--it's almost too tempting to just to grab a spot and watch the dawn slip away into dusk. Though it can be a bit of a madhouse on weekends, a week night out here with friends can be no better spent. Featuring a number of artistic programs such as short-film screenings, jazz and world music concerts, and literary theater, Au Chat Noir, plunked between Belleville and Oberkampf, is the area's own slice of vintage, must-see Paris. Though it's admittedly a little rough around the edges, the imperfections only lend to the cafe's genuinely bohemian ambiance. WiFi is available for anyone looking to do some work during the day, but we recommend closing the books and taking in a show or nursing a good (cheap) drink when the evening crowd begins to settle in. "Pause" is probably the last word that comes to mind when trying to describe this happening brasserie in the Bastille district. While it's certainly a good spot to take a seat and watch the world go by, Pause is a constantly-buzzing, hipster-bohemian hang out that's perfect for any young expat hoping to blend in.